Horvath. All Copyright © 2 01 3 a re guarded by law and by SCIRP as a guardian. an initial action is judged, the less severely its concurrent commitment condition is judged; and vice versa. der several unique ideas for future research in this field. solute emergent moral distinction between right and wrong. 1978; Smetana, 1981; Smetana & Braeges, 1990). Boa, Fu, Talwar, & Lee, 2010). the literature is q u ite sparse and diametri c.
ise,” as a valid promise only if the characters went to the store. until the age of 9 or 10.
participating in a particular sport). were left to make their own assumptions about the individual. predictor of the outcome (p = 0.14). acting, F (1, 34) = 43.51, p < 0.001.
personal choices in general (see Figure 1(a)). four-point scale where 0 = OK, 1 = a little bad, 2 = bad, 3 = very bad. same way they judge actions from the three specified domains. dren do not judge broken commitments in a uniform manner. conditions according to each unique circumstance. ment to the personal choices made by the story card characters. severely its concurrent commitment condition will be judged. collected in the current study supports this hypothesis. 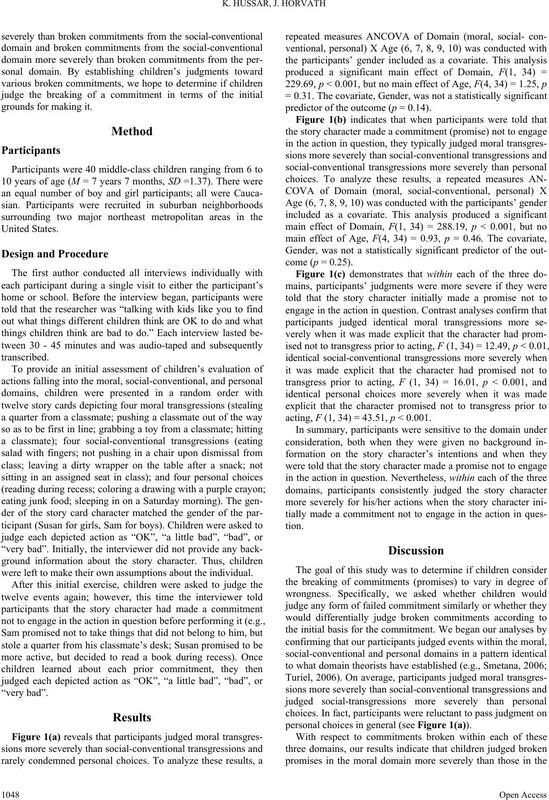 tive judgment scale as well as a wider age range of participants. promising. Journal of Child Language, 15, 157-173.
guage: Vol. 7 (pp. 223-244). Hillsdale, NJ: Erlbaum. types of lies and truths. Child Development, 70, 1338-1347.
luations of truths and lies. 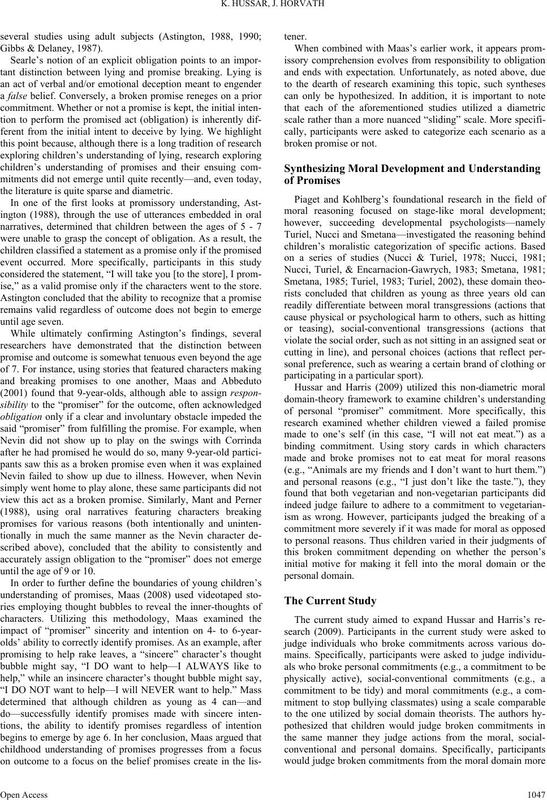 Developmental Psychology, 43 , 278-293.
and understanding promises. 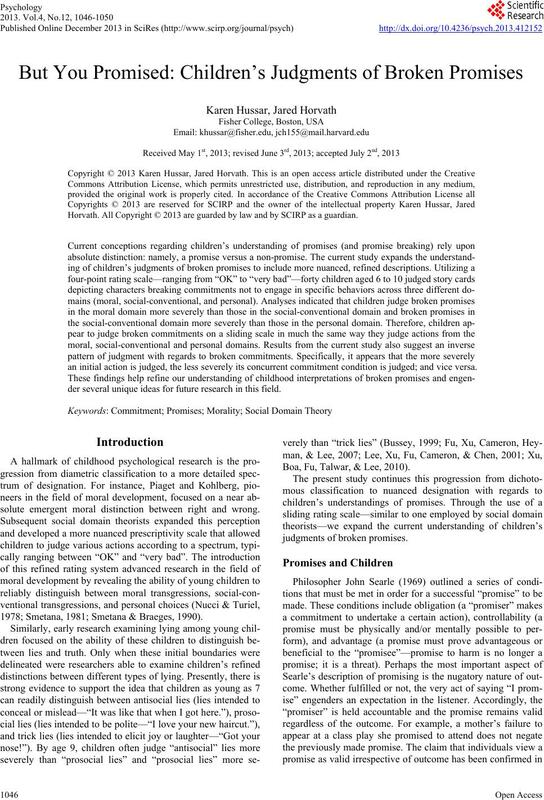 Discourse Processes, 10, 107-126.
of Developmental Psychology, 19, 525-542.
false belief. 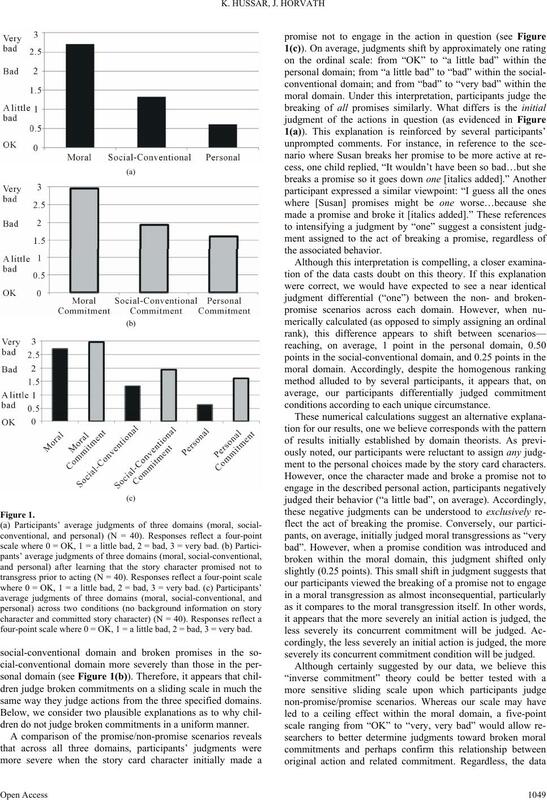 The Journal of General Psychology, 1 3 5, 301-321.
mitment. 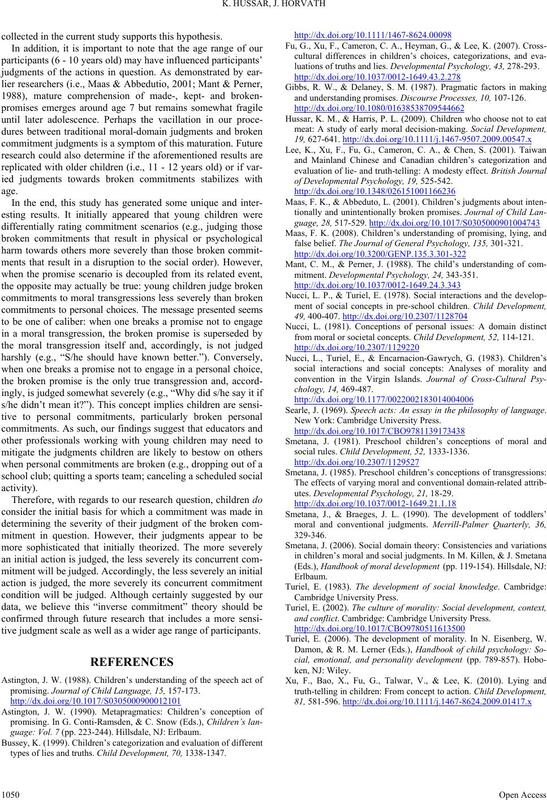 Developmental Psychology, 24, 343-351.
from moral or societal concepts. Child Development, 52, 114-121. Searle, J. (1969). Speech acts: An essay in the philosophy of language. social rules. Child Development, 52, 1333-1336.
utes. Developmental Psychology, 21, 18-29.
and conflict. Cambridge: Cambridge University Press. Turiel, E. (2006). The development of morality. In N. Eisenberg, W.